How do I prevent my bike from being stolen? Well, the natural answer to that is to use a bike lock. But having said that, not all bike locks are designed and manufactured the same. If you’ve spent a couple of hundreds or even thousands on your bike, shouldn’t it be fair to allocate a little budget securing it? Here you can find a list of the best locks in the market today. Whether you’re after a Gold rated one, or just one that is on a budget, I’m sure you’ll find one that suits your needs. 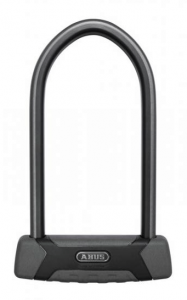 The Abus Granit X-Plus 540 U-lock is my top pick among all bike locks. It’s well-known to be very sturdy and tenacious against bike theft. 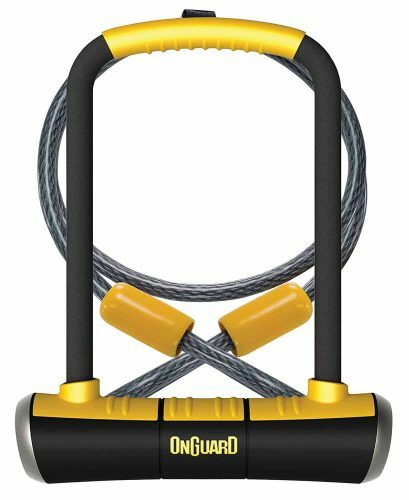 It’s rated Gold by Sold Secure, making it one of the most secure bike lock around. The 13 mm thick shackle is made of premium grade metal, making it resilient to twisting, pulling and leverage forces. To protect the paints on your bike, this lock is layered with a 3 mm protective rubberized coating. Abus’ products are well-known to be very reliable and of high quality. The ABUS Granit X-Plus 540 surely didn’t disappoint and is their flagship bike lock. 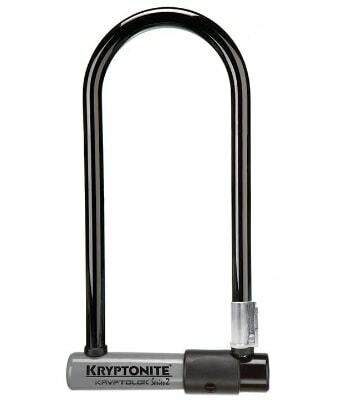 The Kryptonite Kryptolock Series 2 U lock represents the best value for money bike lock in the market today. 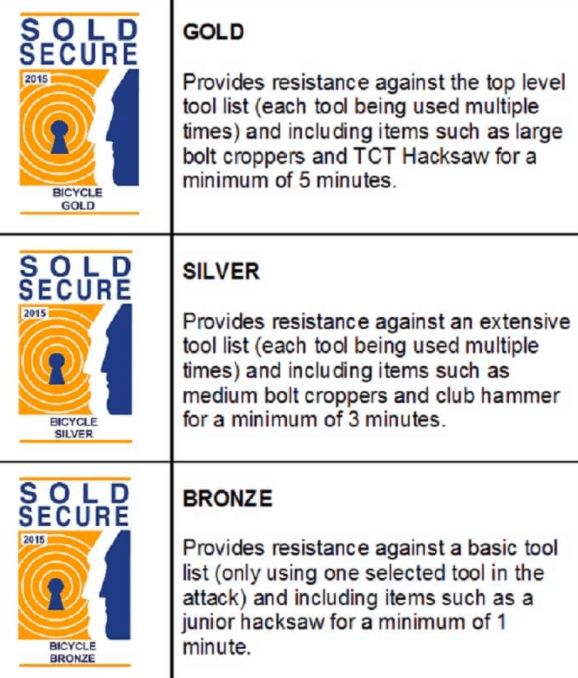 The upgraded, 2017 is now rated Gold by Sold Secure, instead of Silver for the older model. It’s rare that you’ll find a Gold rated U lock at this price point. Going by the description for Gold rating, it means that it offers the highest level of security. It has a 13 mm steel shackle which is thick enough to resist bolt cutters and other leverage attacks from the most opportunist bike thieves. The locking mechanism is protected from dusts and water using a sliding cover. To give you more flexibility, it comes with a separate 4ft long, 10mm thick lock cable. You can use it to wrap around other items like your wheels or accessories. 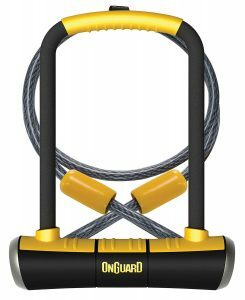 For those who are on a budget, the On Guard Pitbull U-lock offers the best balance between price vs security. With a 14m thick shackle, you can be sure that this u-lock offers you plenty of security and a peace of mind. It uses a four-sided locking mechanism where bike thieves would need to cut both sides of the lock to open it. They can’t just cut and twist it open. There’s a 4ft, fully coated, braided steel lock cable included in the box for you to lock your wheels as well. Best of all, it comes with 5 keys, just in case you lose them. The Keeper 785 is a sturdy, mid-range chain lock from Kryptonite. Unlike most chain locks, it comes with an integrated lock with 2 keys. With this, you don’t need to carry a separate padlock. With a large Kryptonite printed across the sleeves, it looks extremely formidable and is a good theft deterrent. Under the sleeves is a 33.5” (85cm) long and 7mm thick chain, which is sufficient for most commuters in low-risk areas. If you’re fussy about colors, you’ll be glad to know that it’s available in 3 colors; grey, red and purple. Don’t be fooled by the Kryptonite New York Fahgettaboudit Mini U Lock’s size. It’s small and compact, but is a super secure bike lock. The lock’s shackle secured by a double deadbolt, made of hardened steel and with a thickness of 18 mm. It’s also the thickest you can find in the market today. It’ll take the thieves a long time to cut or pull this lock apart using the most powerful tools. You can be rest assured that they’ll be turning their attention elsewhere instead. Lastly, it has a Gold Sold Secure rating, which means it’s tough and extremely durable to be used in very high-risk areas. If you’re after a well-known brand and on a budget, you might want to give the Abus Ultra 410 Mini U-Lock a go. 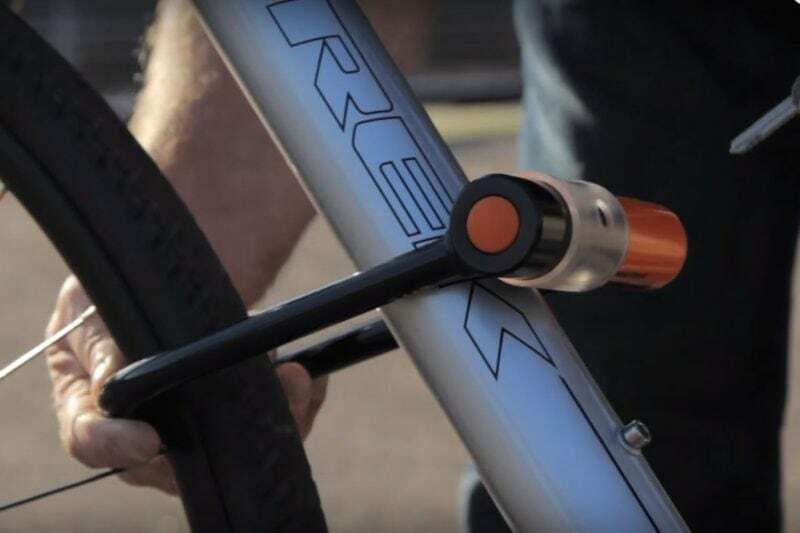 It’s rated silver by Sold Secure and is one of the best lightweight bike lock with a shackle thickness of 12mm and weighing 1000g. You can choose from 5.5″, 7″ or 9” shackle size. It all depends on how you want to lock your bike. From my experience, 7″ is the ideal length as it’s neither too long nor short and should be enough in most situations. Ultra 410 Mini includes a rubberized housing all over the shackle to prevent it from scratching your bike frame. You can also mount it on your bike frame with the mounting bracket that comes with it. It’s made with disc-style cylinder along with double deadbolt system to make it even more secure. 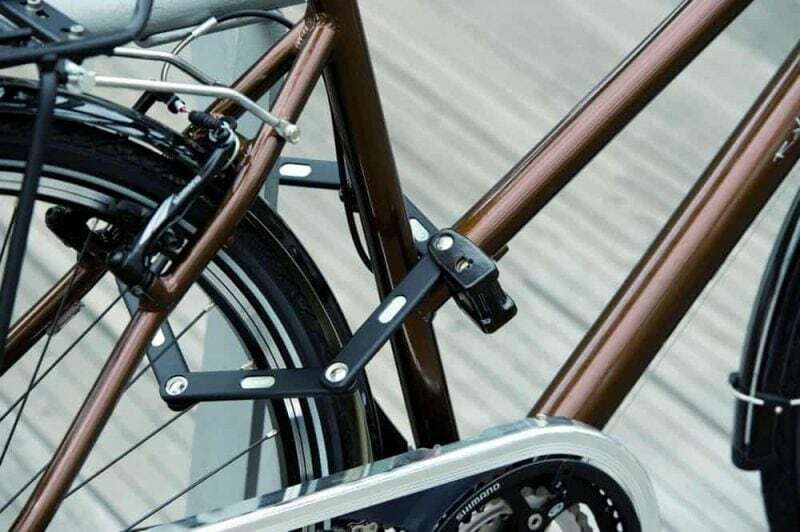 With the shielded double crossbar design, your bike is in for double security protection. To protect the prints and paints of your bike, this lock is covered with vinyl coating as with most premium bike locks. Furthermore, this bike lock is part of Kryptonite’s Key Safe program, which means you can ask for free replacement keys should you lose them. 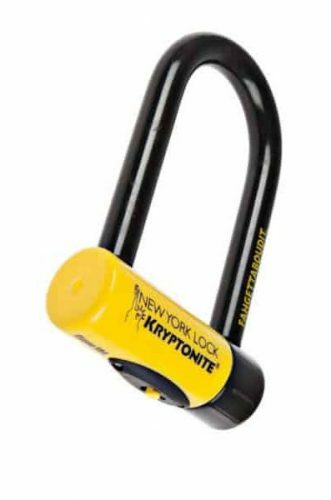 If you’re after a heavy duty bike chain lock, then give the Kryptonite New York 1415 a serious consideration. It’s among the strongest chain lock with Gold Sold Secure rating, giving you the ultimate protection for your bike. As the name implies, if it’s secure enough to be used in New York City, the city with the highest bike theft cases, it definitely can be used anywhere. The padlock that comes with it is equally strong and secure. The manganese steel chain is 14mm thick, giving you the ultimate peace of mind even when leaving your bike overnight in NYC. Depending on your needs, you can choose from either a 39” or 60” version. Also commonly known as D-locks, these are made from hardened steel in shapes of D or U. Normally, the U locks are covered in vinyl or rubber to prevent corrosion and also helps to protect the paint of your bike. Pros. Compared to other locks, U locks are one of the hardest to break, pick or drill, even with a strong bolt cutter. Cons. Because they are mostly made out of steel, they’re pretty heavy to carry around. The Abus Granit X-Plus 540 U Lock is represents the best value for money. If you’re looking for one that is small, yet very secure, consider the Kryptonite New York Fahgettaboudit U Lock. Chain locks are made out of steel chains and they usually vary in length, weight and chain size. Chain locks often come with a built-in lock using combination locks or keyed locks. One such example is the Kryptonite Keeper 785 chain lock. Pros. Chain locks are also usually longer and can reach up to 6 feet, which means it can easily be wrapped around your bike. It can also endure tensional forces. Cons. Depending on the quality, chain locks are can often be broken by thieves using torsional forces. Cable locks are made of braided and twisted wires. They’re typically coated with plastic or rubber so that they don’t scratch your bike frame. Pros. 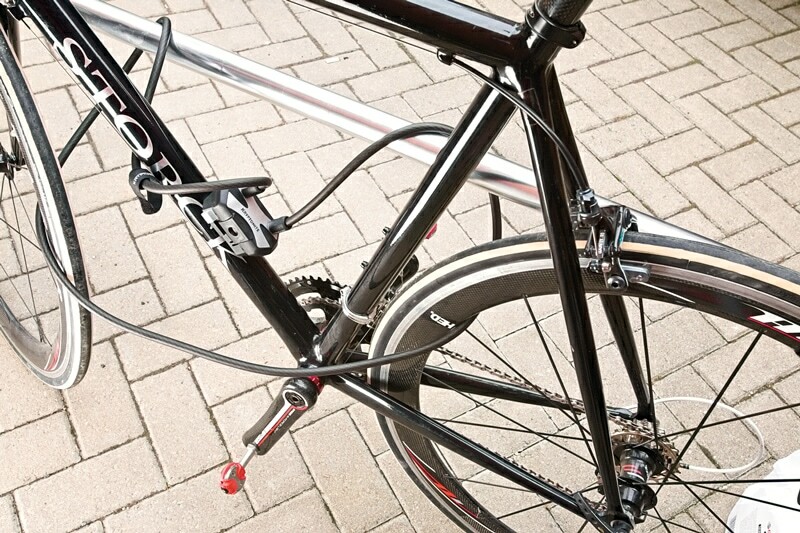 Cable locks are the lightest of all bike locks, which means they’re easier to carry. They’re also flexible and don’t need too much effort to be wrapped around other objects. Cons. Cheap cable locks can easily be cut using bolt coppers. Furthermore, most cable locks don’t have gold or silver sold secure rating and typically rated with bronze rating, which isn’t good. Folding locks are made out of steel bars connected through rivets. They have the most distinctive designs among all bike locks. If you’re all about aesthetics and new designs, you’ll love this. Pros. Easy to carry around and can be kept compact in your bag. They also vary in length and sizes, so there will be various options for you pick from. Cons. Folding locks are relatively still new to the market, which means it’s not as available unlike its counterparts. PRO TIP : U locks offer the highest level of security among all as they’re typically thick and available in various sizes. If you’re eyeing a specific bike lock, it’s important to know its security level. This is to know if a certain bike lock is worth paying money for and if it’s durable enough to withstand the various techniques used by thieves to break them. But as consumers, which ratings do you go to and who should you trust? Most manufacturers use their own description about how their bike locks are at a certain level, which would probably leave you and I confused and totally puzzled because we have no idea about the real meaning behind it. Sadly, most leading manufacturers use their own security ratings and only compare among their own bike locks, which make their ratings even more unreliable. Sold Secure is a reputable non-profit association that evaluates security products sold to the public and provide ratings. 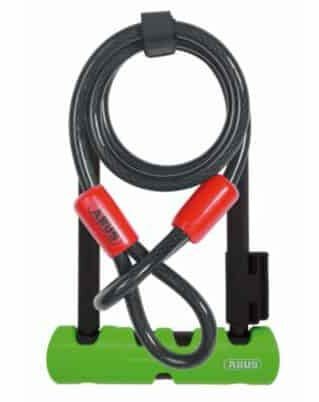 Bike locks are one of those products they evaluate among many others. To have their products rated; manufacturers send their products to United Kingdom. Gold. This is the highest rating. Any bike locks that have this rating means it offers maximum level of security. For example, the Abus Granit X-Plus 540 U Lock and Kryptonite Kryptolok Series 2 U Lock. Silver. Offers a medium level of security and gives off good enough resistance to determined thieves. For example, the Abus Ultra 410 Mini U Lock. Bronze. This is the lowest rating by Sold Secure yet it provides sufficient security from opportunist thieves. Bike locks with this rating is mostly recommended for cyclists biking around normal risk environment. By now, you’d probably be asking, what’s the difference between all the security ratings? Sold Secure is the most trusted ratings among all security products like bike locks. Their ratings are far from biased. So most likely they’re going to tell the truth about certain products. The scheme is tested by a group of professionals and performs it by doing old and modern theft procedures. You can verify the Sold Secure ratings of a bike lock from their online database. Bike locks also differ from thickness, length and weight. If you want to secure your bike against an immovable object, then I’d recommend opting for a lock with lesser diameter (example: Kryptonite New York Fahgettaboudit) that is just enough to wrap around the bike frame. But isn’t the bigger the better? 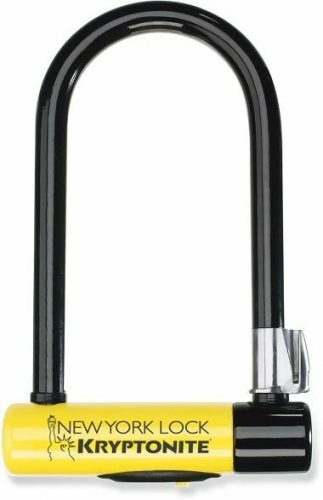 Thieves can take advantage of the extra space available inside the bike lock by using a leverage bar. Also, the weight of the lock also matters since you’re basically going to carry this around wherever you ride. 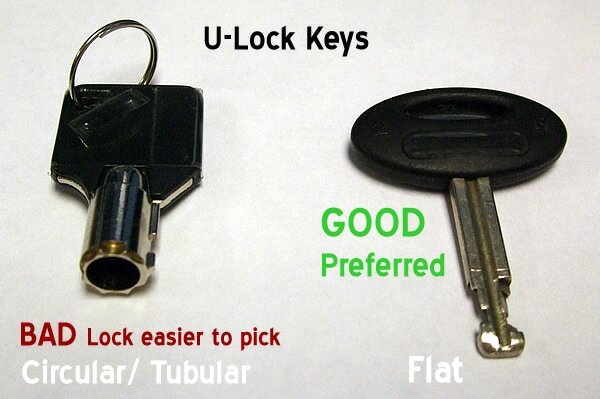 Key locks use circular/tubular shaped keys or flat keys. It aligns the spring loaded pins located inside the lock and opens once the right key is inserted. Keyed locks are generally durable and hard to break. However, if you buy a cheap bike lock, there’s a high possibility that thieves will be able to pick it by just using a pin. Combination bike locks on the other hand uses multiple dial locks or single dial locks, which means it requires you to remember a series of numeral codes. It’s convenient to use because you don’t have to worry about losing your keys unlike the keyed bike locks. In spite of this, combination bike locks can still be cracked by any determined thief in around 40 minutes to 4 hours. PRO TIP : Keyed bike locks are preferred and provides more security. While there are hundreds of bike lock brands in the market today, some are always the go-to brands. Kryptonite and Abus are the top 2 bike lock companies and they’ve both been around since the 70s. But which one is the best? Abus is a prominent European brand founded in 1971. They’re one of the first companies to offer bike locks and since then, they’ve been known for their reliability and good reputation. Their locks are made in Ruhr Valley located in Germany which ensures that they’re using quality European steel. Abus also offers replacement keys in case you lost it. Each Abus bike locks come with a card where you’ll quote the code on it to them for keys replacement. 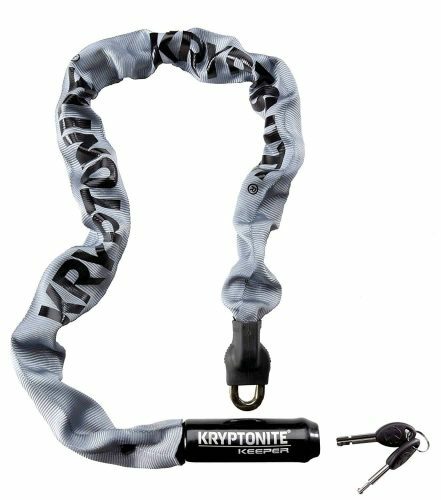 Kryptonite Locks has been around since 1970 and was founded in United States. They are usually a little cheaper than Abus, which makes it a good candidate for those trying to save money. Moreover, Kryptonite provides one of the best customer services. In case you lose your keys, they offer to give replacement keys for free so long as you’ve had your lock registered. 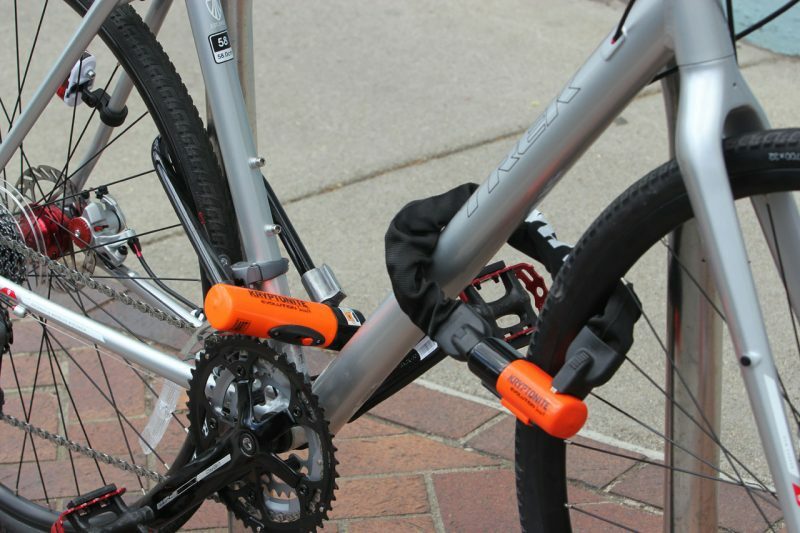 Additionally, they also offer their own anti-theft protection if your bike ever get stolen because of their locks. One thing to note though. 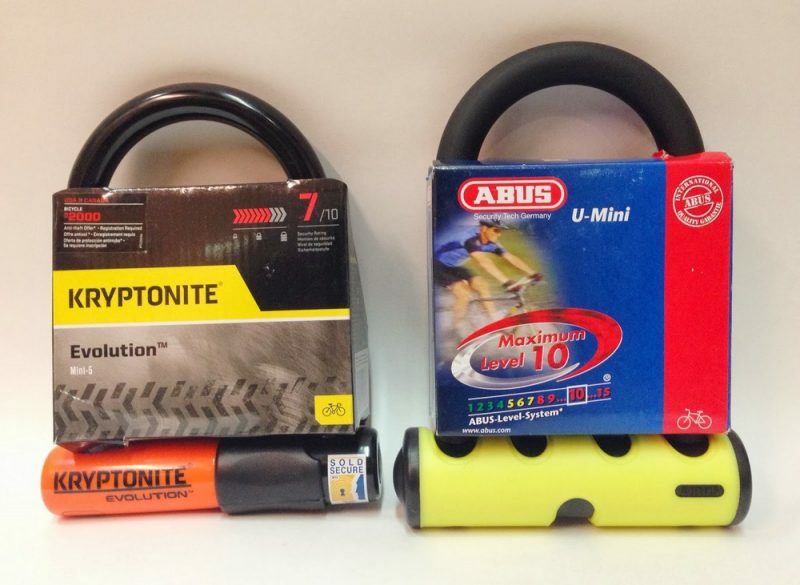 Kryptonite manufactures their bike locks in China/Taiwan as compared to Abus in Germany. All in all, if you want to achieve reliability, value for money and excellent service, then Kryptonite it is. 1. Which bike locks are the safest? The best type of bike locks are definitely U locks, taking into consideration of all the pro and cons. You can see my list of U locks recommendations above. U-locks offer the highest level of security among all as they’re typically thick and available in various sizes. Because they’re made out of hard metal and rigid construction, U-locks are pretty challenging for bike thefts to cut or break. 2. 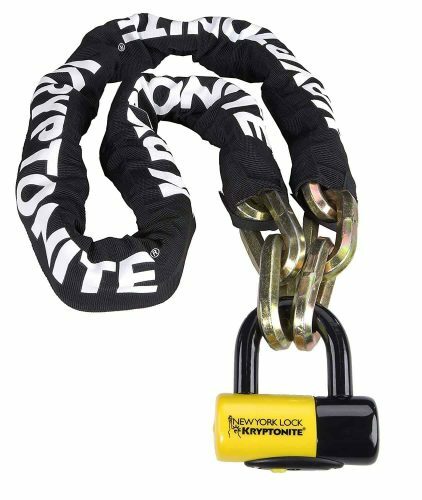 Which U-lock thickness should I buy? Go for U-locks with diameters ranging from 16 to 23 mm and above. This way, even if the thieves use the biggest bolt cutter on the planet, they’d have a hard time doing so. For U locks, it’s smarter to select the ones with thicker metals. An average-sized bolt cutter can easily cut through 13 to 15 mm of metal no matter what kind of metal it was made of. 3. Can the locks be cut? In short, the answer is yes. However, it depends on various factors such as below. Type of Tools. There are many types of tools use to steal a bike, from bare hands to cable/wire cutters, hacksaws, hammers, crowbars, bolt cutters, hydraulic jacks and even portable angle grinders. The good news is, a stronger bike lock requires a more powerful tool to break. This itself is a big deterrent factor. 4. What can I do if I can't my keys? Normally, keyed bike locks come with 2 keys, so you can keep the other 1 as a backup. However, it’s not uncommon to see cyclists lose both of those keys. Luckily, most companies, especially reputable ones provide replacements, assuming you’ve registered your bike locks or remember the key numbers written on the key.